Understanding the processes driving plant phenology is crucial for assessing how shifts in climate affect plant productivity and species’ distribution. Despite the key role of fine roots in carbon and nutrient cycling, root phenology is less well characterized than shoot phenology, due largely to methodological problems when measuring root systems at depths > 1.0 m. Fine root demography is also poorly related to the better established patterns of aboveground primary and secondary growth. 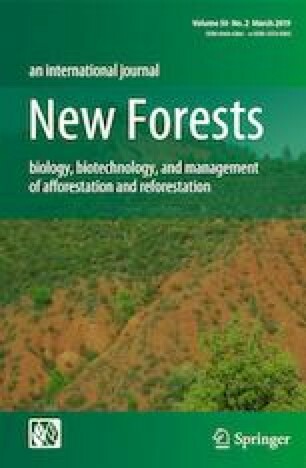 We examined the influence of climatic factors on the dynamics of fine root elongation rate (RER), to a depth of 4.7 m, and assessed relationships with shoot phenology of walnut trees (Juglans nigra × J. regia) in a Mediterranean agroforestry system. Rhizotrons and minirhizotrons were installed for 21 months to monitor RER. Dendrometers were used to measure trunk and lateral root radial growth during the same period. Results showed that RER was not synchronous with budbreak and leaf unfolding (occurring from April to May) at any soil depth. However, during phase 2 of the growing season (June–November), daily RER in the upper soil (0.00–1.70 m) was synchronous with both trunk and lateral root radial growth, which were themselves positively correlated with the mean monthly soil and air temperatures and the mean monthly solar irradiance. Mean daily RER was not correlated to mean monthly soil and air temperatures at any soil depth during phase 2 of the growing season. However, during this period, mean daily RER of very shallow roots (0.00–0.85 m) was significantly and positively correlated with both mean monthly soil water content and solar irradiance. Maximal daily RER occurred during phase 2 of the growing season for the three upper soil layers (June–October), but peaked during the aerial dormant season (December) in the deepest soil layer (4.00–4.70 m). We conclude that drivers of phenology for different tree organs and between shallow and deep roots are not the same. This spatial plasticity in growth throughout a tree enables it to maximize resource uptake, even throughout the winter months, and thus is a highly useful mechanism for increasing tree resistance to abiotic stresses. The online version of this article ( https://doi.org/10.1007/s11056-019-09718-9) contains supplementary material, which is available to authorized users. Thanks are due to J. Nespoulous, L. Merino Martin and M. Ramel (INRA) for technical assistance, to the Conseil Départemental de l’Hérault which provides financial support to INRA since 1995 for the monitoring of agroforestry systems, to C. Béral (Agroof) and to the team of UMR System Montpellier (Jean-François Bourdoncle and Alain Sellier) for their help with field and laboratory work and logistics. Funding for a Ph.D. bursary was provided by Campus France and the Kurdish Institute, France (AM), la Fondation de France (YM) and fieldwork was funded by the FORADAPT Project, INRA metaprogram AAFCC (Adaptation of Agriculture and Forests to Climate Change), France.